Lamborghini V12’s are passé. Three million people have seen that clip of a Countach with custom exhausts revving its engine. Let’s see what Lamborghini’s parent company can do in the V12 department. Audi’s last V12 ran on diesel and won at Le Mans three times between 2006 and 2008. The one before that was built seventy years before, ran on gasoline, and powered the Auto Union Type D in the 1938 and 1939 seasons of the European Grand Prix Championship. It was Ferrari-small, only three liters of displacement, but by the time it gained two-stage supercharging for 1939, the engine developed close to 500 HP. This was the car Tazio Nuvolari hit a deer with, in practice for the 1938 Donington Grand Prix. If you would like to one-up the great little man of Mantua and upgrade to perhaps smacking into a bison, now is your chance: chassis #19 of the Type D will be up for auction by Bonhams & Butterfields on August 14 in Carmel, California. 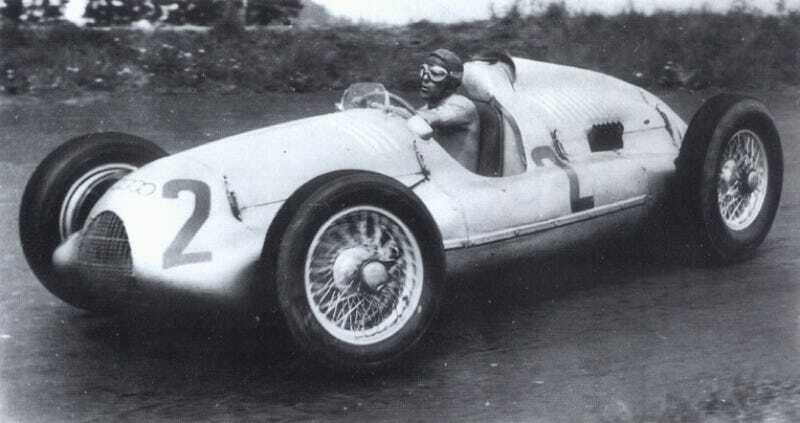 Number nineteen was driven by Nuvolari’s teammate Hans Stuck on the Nürburgring and at Reims. Expect to spend about $8,000,000 and remember: bison are large, aggressive animals.